Mini-Golf & Batting Now Open! The Fun Center will be opening on Monday April 15 for school vacation. Please check back for hours. If you have any questions, you can call the aMAZEment Center at 978-521-7700 x 101. 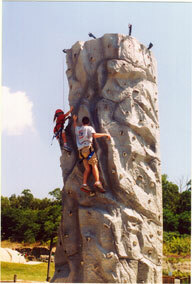 Our rock wall is a 28’ tall auto-belay wall with 5 different trails to choose from. Difficulty can be easy, medium, or hard. Climb alone or with a friend and see if you can make it to the top. The rock wall requires sneakers. Participants must be a minimum of 6 years old and weigh 45 lbs.